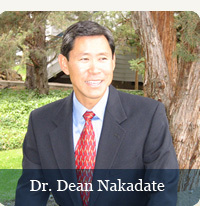 Dr. Nakadate is a board-certified podiatric surgeon with a private practice in Bend, Redmond, Prineville and Madras. He is a diplomate of the American Board of Podiatric Surgery and a fellow of the American College of Foot and Ankle Surgeons. He received his undergraduate degree in Chemistry from the United States Military Academy at West Point, New York. Dr. Nakadate received his doctorate from the California College of Podiatric Medicine in San Francisco and completed a three-year surgical residency at Kaiser Permanente Hospital in Hayward, California. He is board certified in both Foot Surgery and Rearfoot and Reconstructive Surgery. He has been active academically teaching residents at Scripps Clinic in San Diego, California for nearly a decade prior to moving to Central Oregon. During that time, he served on numerous committees with the American College of Foot and Ankle Surgeons and both the state and local society levels. He has held the position of president of the San Diego County Podiatric Medical Society and also was a director on the board of the California Podiatric Medical Association. He also was a consultant for the California Medical Board reviewing podiatric cases. He enjoys spending time in the outdoors with his two sons. He is also active in coaching and officiating the local water polo teams.